Grab it before it is too late. Contact us immediately. (1) Introduction of single frequency, multi constellation operation model: SF-3050A. The new model tracks GPS’s L1 & GLONASS’s G1 and is Galileo’s E1 capable. Attractively priced, the unit is upgradeable to SF-3050(multi frequency), hence lowering the entry cost of the customers. (2) Heading and moving base station RTK for vehicle applications. According to Steve Wilson, Navcom's GNSS Business Manager "These new capabilities offer significant new functionalities and variety of options to meet our customers' ever changing needs"
See full announcement here or contact us for more information. Software upgrade is FOC for all existing users of SF-3050. The just concluded 8th Malaysian Road Conference (MRC) had been a wonderful event. 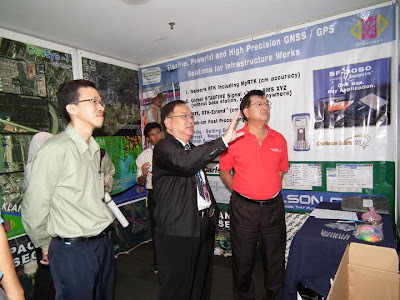 It not only brought together all the friends and associates of the Malaysian Road Community, but also provide a forum to potential customers to explore new opportunities. 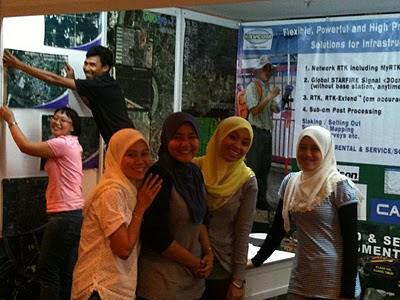 Our colleagues were there on 9th October to get the booth ready on the auspicious day (10.10.10) to welcome the guests. Look familiar? one person working, three others looking? "Yes, thats how we use the Navcom GPS!" Don't you think the technology is fantastic? For the three-day event, we saw an encouraging turn out of visitors, and all of us were kept busy throughout. 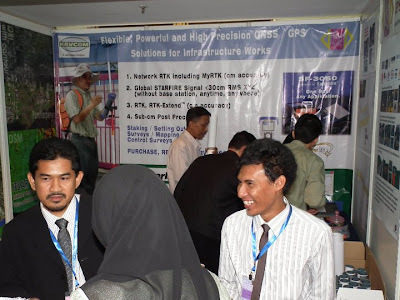 Beside explaining our products and services, we also get the visitors involved by inviting them to answer a few questions on the items displayed in the booth. 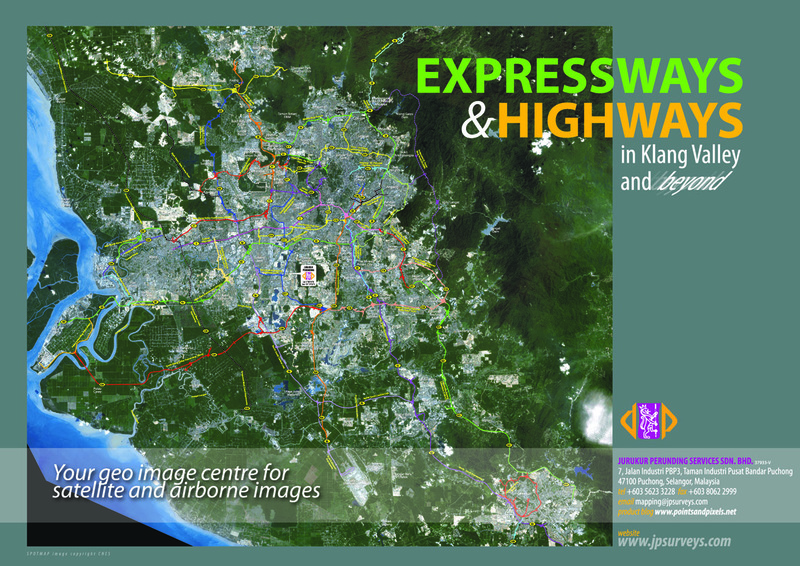 In return, everyone get a copy of our "Highways and Expressway Poster". Learning from our past years' experience, the poster soon became a hot item among the conference participants. Our booth was really packed at times where we have to stay out of it to ease the jam. 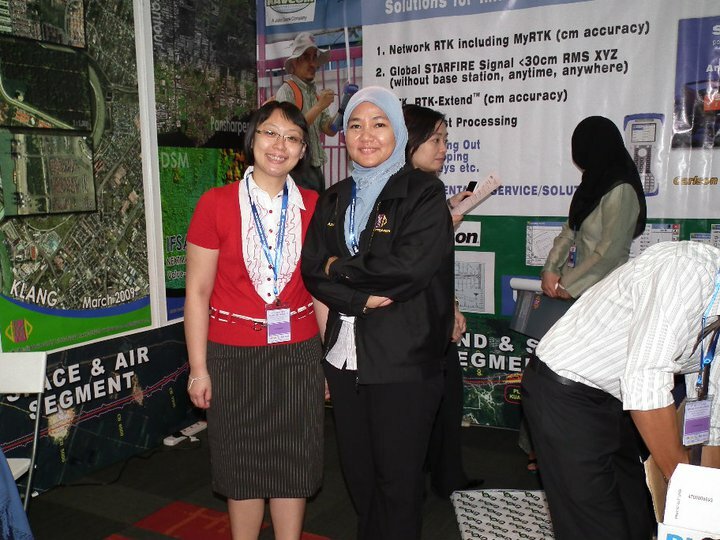 The highlight of the event was the visit of the Deputy Minister of Public Work to our booth on the 12 October 2010. Y.B. 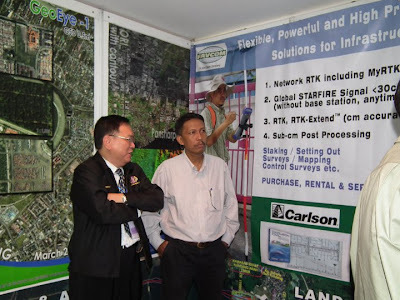 Dato' Yong Khoon Seng made a brief stop at our booth and our Executive Director Mr Sunny Lee presented a frame-up version of the "Highway and Expressway Poster" to him, witnessed by other officials and the press. The fruitful gathering came to a pleasant ending, and we are now looking forward to the next MRC. Thanks to all the visitors, friends and associates, and of course not forgetting all the colleagues for their effort and support. Carlson Software's 2011 office software is now available. Carlson announced the release of Carlson software's 2011 office software with hundreds of improvements for today's need, speeding and easing design work and increasing accuracy. a) Carlson Civil and Carlson Survey: ability to Edit Contours and instantly update the underlying 3D model (updates the underlying TIN surface to match the modified contours), a feature that is unique to Carlson. b) Carlson GIS: New import and export GIS routines for working with SurvCE complete the data loop between field and office. Added support for using Esri Map Standards for CAD to all the GIS data commands, which allows for viewing and editing GIS data in an Esri format. 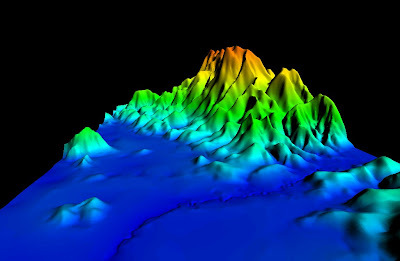 Plus, new ability to create Esri data for sewer networks, lot files, mining timing and surface mine reserves that enables taking this data from Carlson to Esri. Carlson Software is a leading producer of software for land development professionals in the surveying, civil engineering, construction and mining industries. Jpsurveys is the sales rep for these products in Malaysia. Jpsurveys is also the dealer for Navcom's SF3050 GNSS receiver with integration of controller software SurvCE from Carlson. 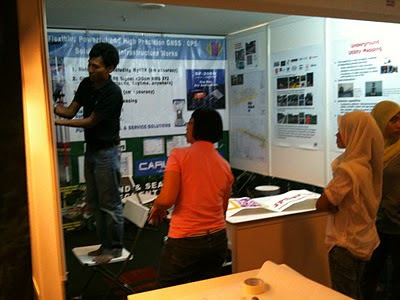 JPSurveys is participating in the 8th Malaysian Road Conference from the 10th to 12th of October 2010 at Sunway Convention Centre. We will showcase our services such as the Satellite Images, IFSAR Elevation Data, Underground Utility Detection and the NAVCOM GPS Systems. 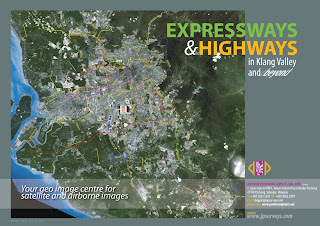 JPSurveys is also launching the 3rd edition of the Highway and Expressway Poster on the auspicious day of 10.10.10 in the 8th MRC. This is our way to say "Thank You" to the Highway Community for their steadfast support, strong encouragement and warm friendship through out the years. This poster will be given away "FREE OF CHARGE"! Do visit us at booth B58 if you want to grab a copy before it runs out. We congratulate our Advisor, Mr Teo Chee Hai, on his 16/04/2010 selection at the FiG General Assembly to be the next President (2011 - 2014) of the International Federation of Surveyors (Federation Internationale des Geometres), hence FIG . 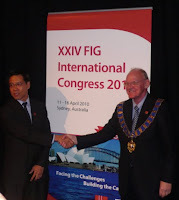 We would also like to congratulate the President and members of PEJUTA (the sole Malaysian member association in FIG) on their successful bid to host the 25th FIG International Congress (including the 2014 General Assembly) in Kuala Lumpur in mid May 2014. Congratulations also goes to Ketua Pengarah Ukur dan Pemetaan Malaysia, Dato' Prof Sr. Dr. Abdul Kadir Taib on his unanimous selection as the Chair of the United Nations Group of Experts on Geographical Names (UNGEGN) Asia South-East and Pacific South-West Division at the Division's meeting in Sydney on 10th April, 2010. 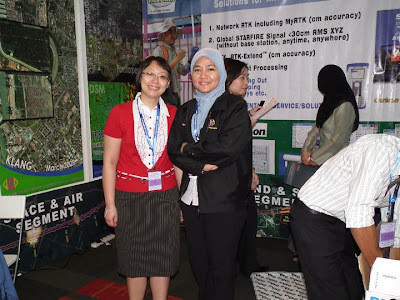 Do visit us at Booth#2 during the Malaysian Remote Sensing Society (MRSS) 6th International Remote Sensing & GIS Conference and Exhibition, 28-29th April (Wednesday-Thursday) 2010 , Putra World Trade Centre, Kuala Lumpur, Malaysia. We will be displaying our wide range of geomatic product and solution using Very High Resolution Satellite Imagery (GeoEye, IKONOS), High Resolution Terrrain Data (Intermap Nextmap/IFSAR), Navcom's GNSS/GPS receivers etc. 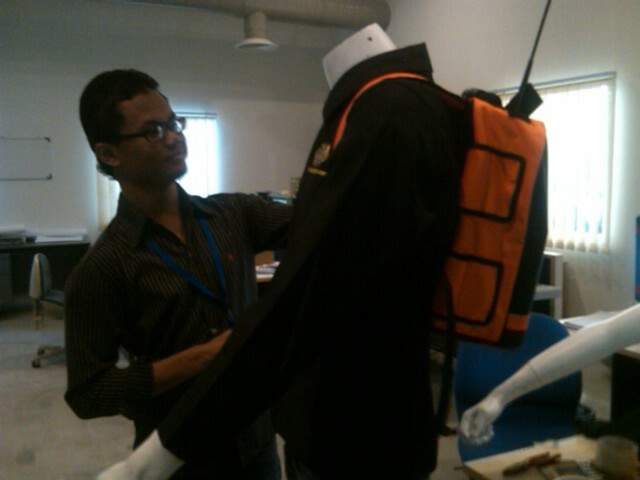 Our surveyor/technical support team member Mr Aidil is dressing up a display model (mannequin-man) to show case the backpack configuration of Navcom's SF3050 GNSS & StarFire solution, which will provide real-time decimeter accuracy any where in the world. In July last year we announced the availability of Navcom's latest GNSS/GPS receiver SF3050 with build in StarFire capability. Subsequently we have brought in a total of 4 units of SF3050 to Malaysia before the end of 2009. Half a year down the road, we are excited to report to you that the model has passed Malaysia's SIRIM approval test. 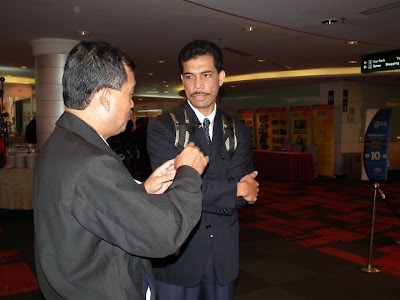 In fact we have already used them in quite a number of projects in both Peninsular Malaysia and Sabah. It has revolutionized the way we worked, provide significant productivity gain and conveniences that we have not experienced before. 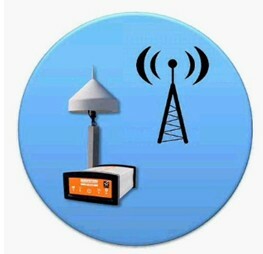 Difficult tasks that can be a nightmare even to the most experienced project manager are now easily solved by the use of this wonderful technology, a modern GNSS receiver, connected to the state-of-the-art StarFire network, hence providing accurate x,y,and z readings anywhere and anytime in the world. There is no need to locate or connect to known points . There is no need for any post-processing computation! There is no risk of having to return to the test site because the first round of results were bad. What you see on site is what you get, the final result, all the time! Beside being able to purchase this unit from us directly, you may also opt to rent it for your projects. Rental rate starts from a mere RM 200+ /day (May 2010)for a minimum rental period of a week. For our Malaysian and Brunei customers: Our sale and technical support team is also available to meet you to brief you more about the system. We will also be more then happy to organize a free demo for your organization. Just contact us or email us mentioning your intended applications and current problem that you are facing. We are featured in Pages 116-119 of the first edition (2010) of Endeavours. This publication highlights 'the world class capabilities of Malaysian professionals and delve into their experiences in breaking into the global market'. This inaugural issue focuses on professionals from the major sectors of PSDC's Registry of Professionals , namely the professional exporters from the construction industry. Endeavours is produced for PSDC by The Writers' Publishing House.